Homeschoolers do not always need to pass the GED test, but some may need it to be approved for apprenticeship for union work. In some states homeschool parents need to prove they have a high school education or the equivalent, so passing the GED test would be a way to accomplish this. GED stands for “General Education Development.” Unions and Trade Schools often will not accept a homeschool diploma or even an unfinished community college program transcript, and so will require their applicants to have passed the GED test. Some states require that a homeschool parent have at least a GED before they may commence homeschooling their children or teenagers. Those looking into a high school competency test for other reasons may want to consider a diploma from a home school program instead. The GED has a “drop-out” stigma attached, and so is not always in your best interest. It may actually be harder to fulfill dreams with a GED than with even a high school diploma from an unaccredited high school! There have been a few changes in GED since January this year (2016). The passing score for the GED® test is now 145 instead of 150. If you scored between 145-149 on a GED® test subject in the past, your status has changed from fail to pass. Log into MyGED (on GED.com) to see your updated status. The GED® with Honors score has been replaced by two new score levels that show you’re ready for college or a career-training program, and in some cases eligible to earn college credits. More information about GED changes. How will my child’s homeschooled high school years end? Answering this question early in your homeschooling career will help keep you on track when you hit the high school years and people begin to question your choices yet again! The following information was taken from the HomeschoolChristian.com message boards. Should a Homeschooler take the GED? Since homeschoolers are some of the brightest and most academically gifted students in the country, don’t demean yourself by stooping to the level of the GED. From the Home School College Counselor. Are testing accommodations available for candidates with special needs? GED Testing Service is committed to ensuring access to the GED® test for all individuals with disabilities and supports the intention of the Americans with Disabilities Act as Amended (ADAAA). With realistic practice, proven strategies, and expert guidance, Kaplan’s GED Test Premier 2017 gives you everything you need to pass the test. Kaplan is the official partner for live online prep for the GED test and our content is 100% aligned with the GED test objectives.While other GED guides are intended for classroom use, our book is designed for self-study so you can prep at your own pace, on your own schedule. 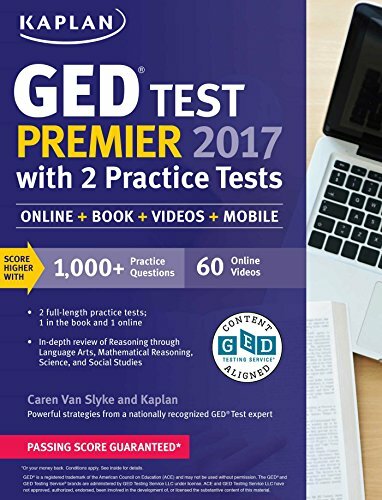 Kaplan is so certain that GED Test Premier 2017 offers the guidance you need that we guarantee it: After studying with our book, you’ll pass the GED—or you’ll get your money back. Our course is heavily focused on “self-help.” We have provided the resources and the tools. The rest is up to you. From the General Education Development Testing Service. Give your students the only practice test designed to assess how they will do on the 2014 GED® test. The GED Ready™ test went through the same norming and standardization study that the official exam went through. That means the questions are designed to mimic the official exam and can be predictive of how a student will perform on the official test. Focused study plans will contain feedback on over 50 different traits measured in the exam. Like many of you, I was staring at limited funding and the overwhelming task before me to pass the GED test. I have created this website to help fellow classmates overcome the challenge of the GED test. A continuing adult education website dedicated to helping you prepare online for the GED High School Equivalency Diploma Test. Our website provides free General Education Development Math and English studying material which include over 80 math videos (200 questions) and an essay writing course. Additionally, students will find articles about test preparation as well as career and college planning. Our articles are up-to-date and use in-depth analysis and interviews to assist GED students who are often deprived of the much needed information. We are continuously adding more information on almost a weekly basis, adding quizzes, tests and other services.